Schumi is a remarkable person, strength of character, discipline etc so hoping that his fighting nature along with the support of his family will work a miracle for him. And they are back!! Who are they you maybe wondering? My 2 eldest first day of school today - woohoo yippee hooray - though honestly Im feeling a bit sad, a bit nostalgic but really happy to be back in the routine again, we all thrive on it. So its just me and Master 4 who will be hanging off my legs no doubt or the first few days till he gets used to occupying himself again. Gong Xi Fa Cai everyone!! Happy lunar new year to everyone celebrating and let's hope the year of the horse brings everyone peace, health and prosperity. Sorry for no decorations today, but I couldn't quickly find anything online. 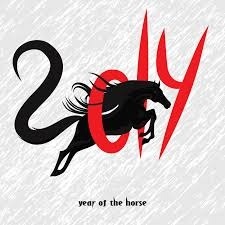 Wishing prosperous Year of the Horse to all! lovely illustration, Ocean-- thanks or sharing! Ha ha he he heee . "Imagine George raising 1.2 million just for a "date-ish"... some guy...BUT hell no I've seen him ... he is not THAT perfect...how does he do it?" "But thats the thing, it's his imperfections that make him perfect"
Drove on a bit... THEN SUDDENLY I HAD A LIGHT BULB MOMENT .... I have to admit I was half TERRIFIED of the NYC gig, I have a basket load of imperfections to hide! BUT, I suddenly thought "Thats what makes me perfect too". Now, it may take a time to believe it...but work is now in progress, as they say. Yes I´m out here and I thought the same thoughts as you, believe me But 1.2 million is good amount of money.